So a lot has happened over the last month when it comes to hardware. We've sold off our Jupiters. Not just Jupiter #1 but also Jupiter's #2 & #3 also. The first two were sold for approximately $6k apiece and the third sold for $5.2k (Do keep in mind Paypal fees). Of the purchases, after transferring USD to BTC we have added 10% of the coins to the dividend fund (to be dispersed over the next few months), 5% of the coins to the buyback fund, 5% of the coins to the salary fund and the remainder (80%) to the re-investment fund. Do keep in mind there is approximately $5k that still needs to be traded for BTC and it will be traded as quickly as the government currencies allow. So at the moment we have no hashing power online. With the latest news from KNC not specifying any new targets for hashing performance from their Neptune line of products we have the 17.8 TH/s of equipment on order following Bitcoin Mining hardware on order (See Below For Bitcoin hardware). This could change in the future are they're are napkin calculations that this hardware will have a higher hashrate per unit than 3TH/s. Assuming that the Network hasrate rises 50% month over month for the next two months we should Leave us with 0.03% of the network hashrate which is right at our historical average. In addition we have 4 Alpha Vipers on Order for a total of 100MH/s of Scrypt Mining power. 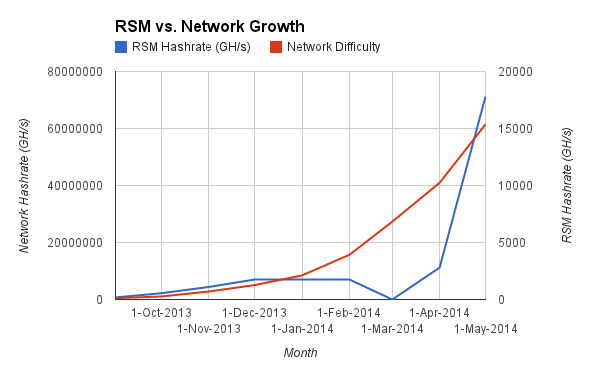 RSM is investigating the possibility of building a P2Pool node. We would mine using this and have access to all the merge mined alt coins we could handle. Funds for such a project would come out of the Re-Investment Fund. RSM is also considering the possibility of building a GPU Rig specifically for altcoins like Etherium and Mastercoin which aim to add valuable market features to the cyptocurrency paradigm, Primecoin which adds a mathematically relevant calculation to mining or Datacoin which attempts to add general storage features to the blockchain.